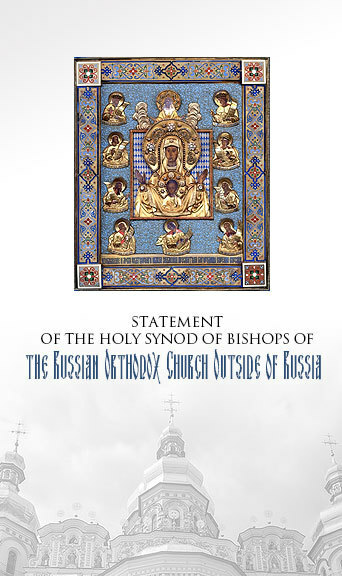 The Synod of Bishops of the Russian Orthodox Church Outside of Russia communicates to the plenitude of her clergy and faithful, and to her fellow Orthodox Christians throughout the world, her profound sorrow at the uncanonical undertakings perpetrated by the Church of Constantinople over the past days; in particular with regard to its Message of 11th October 2018. Simultaneously we express our complete support of the position taken by the Holy Synod of the Patriarchate of Moscow, following its meeting of 15th October 2018 and announced in its statement of the same date. The illicit actions of the Church of Constantinople are able to suffer no canonical defence and constitute a grave and dangerous injustice against the traditions of Orthodoxy, as well as a shocking disregard for the spiritual welfare of the sheep of Christ (cf. John 10.3, 11). Having expressed its intention to establish stravropegia of its Church in the Ukraine, Constantinople thus solidifies its intrusion into another Local Church’s canonical territory, an anti-canonical violation of the highest order which the Synod of Constantinople has no power or right to undertake. We make explicit that under no circumstances will we consider such institutions to have any legal substance, nor will we acknowledge any legitimacy whatsoever to those who, deeming themselves shepherds, submit to these non-Church establishments. Yet more grave is the decision of the Church of Constantinople to ‘restore’ to canonical status various schismatic individuals that have, on account of severe canonical violations, been deposed from their rank by the Bishops Council of the Russian Orthodox Church, with the assent of the other Local Orthodox Churches. Proceeding from a false assertion that the ancient prerogative of receiving appeals for pan-Orthodox mediation equates to an autonomous and unilateral power held by the See of Constantinople, that See now arrogates non-existent powers to itself in the attempt to justify its interference in the canonical contexts of other Local Churches. The reality, however, is that the Church of Constantinople possesses no such canonical authority and, in exercising this lawless abrogation of authentic primacy, distorts the true nature of the concept of being “First among equals,” directly opposing canonical Orthodoxy. For the sake of the clear understanding of the present situation amongst the faithful, we hereby make explicit that the just anathematisation by the Bishops’ Council of the Russian Orthodox Church of schismatics that persist in their errors, cannot be and has not been overturned by the unilateral action of the Church of Constantinople. In the eyes of God, and in accordance with the Holy Canons and the teachings of the Orthodox Church, these individuals remain under their just condemnation, and are considered in schism; that is, fallen away from Holy Orthodoxy. Moreover, we remind the faithful of the Holy Canons which clearly express the principle that those who intercommune with the justly deposed, themselves enter into schism from the Orthodox Church (cf. Antioch, 2). Therefore any who, following the lawless decision of the Church of Constantinople, enter into communion with these schismatic individuals, do thereby depart from Orthodox canonical unity into schism, and the mortal peril it represents to the soul. The Orthodox Church of the Ukraine, under the Archpastoral care of His Beatitude Metropolitan Onuphry and his martyric co-Archpastors, remains today, as it has since the Act of 1686, the sole canonical body within that blessed land. The present decision of the Church of Constantinople to ‘revoke’ the Synodal Letter of that year is simply meritless, and according to the Orthodox canonical tradition is by nature an impossibility. Despite the statement made by the Holy Synod of the Church of Constantinople on 11th October of this year, the faithful may rest fully assured that the Act of 1686 remains valid and binding, and that the canonical authority of the Church of Ukraine and of the Patriarchate of Moscow remain unaffected by this groundless presumption of power by the Phanar. In light of these most grievous affronts to the very nature of canonical Orthodoxy, the Holy Synod of Bishops of the Russian Orthodox Church Outside of Russia has no option except, with profound sorrow and yet with full conviction, publicly to register her assent with the decision of the Holy Synod of the Patriarchate of Moscow, which recognises that continuing Eucharistic communion with the Church of Constantinople is impossible, at any level, until this ancient and once-glorious sister Church repents from its introduction of false and alien teachings about primacy and universal authority, contrary to the ancient Orthodox Faith, and ceases from its lawless actions. We thereby inform our clergy and faithful that Eucharistic intercommunion with the Church of Constantinople is presently impossible, for Hierarchy, Clergy and Laity. 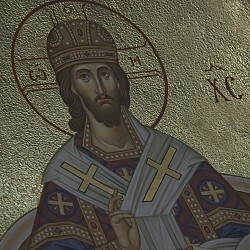 So long as this situation remains, it is not possible for clergy of our Church to celebrate in any parish of the Church of Constantinople, or for clerics of that Church to celebrate in ours; nor is it possible for laypersons to partake of the Holy Mysteries performed in the temples of the Patriarchate of Constantinople. We further reiterate that the Russian Orthodox Church Outside of Russia will not participate in theological inter-church meetings, or other dialogues, including the regional Assemblies of Bishops, which are chaired or co-chaired by clerics or hierarchy of the Church of Constantinople. We call upon all the faithful to redouble their prayers for the peace of the Church, currently being so tryingly put to the test by the lawless actions of a novel ecclesiology and false teaching — and not to lose heart or grow faint, trusting that the Lord’s Wisdom conquers all falsehood, if only we hold fast to what is true and sacred. We implore the Primates of the Local Orthodox Churches to reflect upon the current circumstances, in due course coming together to reach an authentic, canonical resolution to these urgent matters. We firmly believe and hope that our Lord Jesus Christ, Who does not abandon His children and Who overcomes all human pride with the limitless love of Divine Truth, will strengthen His Beatitude Metropolitan Onuphry and the Hierarchy, Clergy and Faithful of the Ukrainian Orthodox Church, and all Orthodox faithful of all tongues and lands.